I hope you don't mind the picture but I think the nice thing about the Internet is the ability to get to know who you're doing business with more than you do with a 'yellow page ad' or some canned speech. You don't just buy widgets, you buy the person behind the widgets. I recommend it to anyone placing a business on this website. This is Pine Island. It's not the city. It's supposed to be personal. So, let me tell you a little about myself and how I came to know Pine Island. 24 years ago my family moved from Massachusetts to Ft.Myers. I was 16 yrs old. 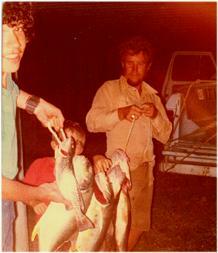 I loved to fish. An uncle of mine used to take me to the old wooden bridge in Matlacha regularly. I was being taught the art of Snook fishing. We'd be out there till 2:00 in the morning most nights being hypnotized by the tide passing beneath our hanging propane lanterns. If I concentrate, I can still hear the hissing sound of the propane lantern now and remember watching the crab, shrimp and other nightlife dart in and out of the glowing aura of the lantern as it reflected off the moving water. Every now and then, our peace would be broken and all hell would break loose when a Snook would hit. I've never forgotten those days. They were my best memories ever. What could be better than fishing (don't answer that). Now I'm almost 40. My family moved away from Ft.Myers when I was still a teenager. I've lived in Orlando all the years since then. I've never forgotten Matlacha though. I never forgot what it was like catching Snook on a Pinfish from that old wooden bridge. About ten years ago I rediscovered Pine Island when some friends and I started going to Boca Grande to Tarpon fish. It was great stuff. This was no tourist fishing expedition. We'd pitch a tent on the north tip of Cayo Costa and I'd live in that tent for up to two weeks straight. Friends of mine from Orlando would alternate coming down to fish with me. No showers, no shaving, just fishing all day and all night until I dropped and then I'd get up and do it all over again. On the way back to Orlando I'd already be thinking about getting back next year. Well, a bunch of years and one unfortunate divorce later I woke up and said to myself, "myself, what are you doing living in the middle of the state when you love the ocean and everything around it so much"? My answer was very clear...and when I had to decide where to move, there was nothing to think about. That was a few years ago. I'm here and I've never regretted for a moment my decision to come here. I start most mornings by going to the local coffee shop. I sit down, have a cup of coffee and talk about fishing. There's ten more just like me there. We go for the same reason. It feels right. This is who I am and I'm glad I've been able to find this contentedness at a reasonably young age. The software & computer business I started in Orlando in 1991 is still in operation. Its source of revenue is derived exclusively through internet sales and referrals from satisfied customers. You may visit it on the web at www.Callutopia.com. Recently, I made a decision to exploit my areas of expertise in the Pine Island area. One of those areas is of course computers. I want to be Pine Island's computer guy. As part of the effort to become Pine Islands computer source, Utopia Computers & Mortgage Websites, my Orlando based company, purchased the web site addresses PineIsland.Net, CabbageKey.Com, CayoCosta.Com & Bokeelia.Com all at one time with the idea of becoming 'the' premier web sites for information on these islands. As you can see, the PineIsland.Net web site is moving right along. The fact is, it's my passion. I love the area, the fishing and the wildlife. I enjoy writing about it and taking the hundreds of photo's involved. I've talked to nearly every business owner on the island. This web site will be more than just a commercial venture. It will have a life of its own. It will be the peoples web site. This site was not put up just to sell real estate. This site was put up because it was in my heart and I believe the finished product will reflect that. Now, back to business. Here is my statement to you. 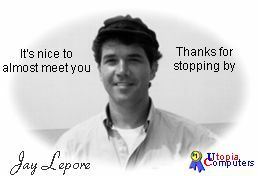 If you do business in any capacity with Utopia, I, Jay Lepore promise you'll get my company's best effort. You'll get honesty and hard work. You'll get 20 years of 'real world' computer technician and software programming experience and last but not least you'll get a good deal because of our low overhead. If I fail, it won't be because I didn't put forth every effort possible. My company motto is that 'you get what you pay for AND you don't pay for what you don't get'. If I don't get the job done right, you don't owe me anything. The Bible says in not so many words that a person's most valuable possession is their reputation. It's the only thing that lives on when you're gone. I believe in the source of that wisdom and that concept and will do my best to live up to it.